The New York Knicks have become the 17th NBA team to sign a deal to wear an advertising patch on their jersey, announcing Tuesday that the logo of website-publishing platform Squarespace will grace their uniform. Specific terms weren't disclosed. David O'Connor, CEO of the Madison Square Garden Company, said the Knicks have a multiyear deal in place with Squarespace. As part of the partnership, the Madison Square Garden Company -- which owns the Knicks and the Garden -- and Squarespace will provide financial support and give digital advertising opportunities to local small businesses that use the website platform. 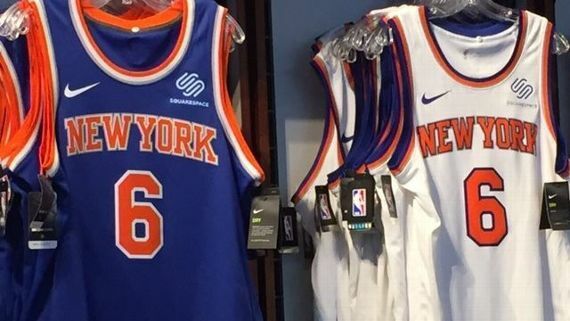 The Knicks join the many teams in the NBA that wear an ad on their uniform. Squarespace is one of a number of e-commerce companies that have deals for jersey ad patches, including Wish (Los Angeles Lakers), Rakuten (Golden State Warriors) and StubHub (Philadelphia 76ers). The logo will begin appearing on Knicks jerseys for Friday night's preseason game against the Washington Wizards, and the Knicks will immediately sell the jerseys with the patches on them inside the arena. As with all teams, jerseys bought outside team stores will not have the corporate logo. "Not really," O'Connor said. "... This is a trend that's happening more extensively globally throughout a lot of different professional sports. This is a relatively small step for the NBA, relative to what's happening elsewhere in professional sports. We think it's a good one." Squarespace, which was founded in 2003, is based in New York and hit $100 million in revenue in 2015. It has raised nearly $80 million from investors in the past seven years. Information from ESPN's Ian Begley was used in this report.